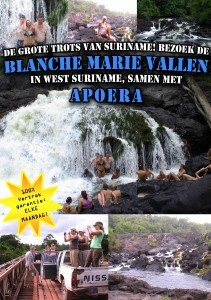 Bezoek www.Blanche-Marie.com de mooiste watervallen van Suriname! Booking of this tour can be online at www.blanche-marie.com or at one of our sales locations! The very impressive Blanche Marie waterfalls are located in the Bakhuis Mountains at over 300 km south of Paramaribo. These waterfalls are one of the biggest in Suriname. They cover an area of ​​over 100 meters. In nature you can find all eight monkey species of Suriname. You will also find over 200 species of birds and the Brazilian Giant Otter. For fishermen, it is also a paradise. Think of the Amazon Giant catfish (Spikri Kati) and Anjoemara. From Paramaribo it is about 4.5 hours drive through the jungle to the waterfalls. The first we sleep in hammocks at the waterfalls. The second day we relax at the waterfalls and we make a beautiful forest walk. In the afternoon we depart towards the Native – Indian village Apoera. In Apoera we sleep in beds. The third day we will explore Apoera and make a trip across the Corentyne River. The fourth day we will return to Paramaribo, on the road we will make a stop where we will include Witagron for a walk. During the journey to the Blanche Marie falls there is lots to do. Book your trip and you will enjoy the various activities that we offer.